Let the Horses Inspire You! New York artist Mickey Paraskevas designed the 2009 WIHS Poster. Washington, DC – April 28, 2010 – Let the horses inspire you! 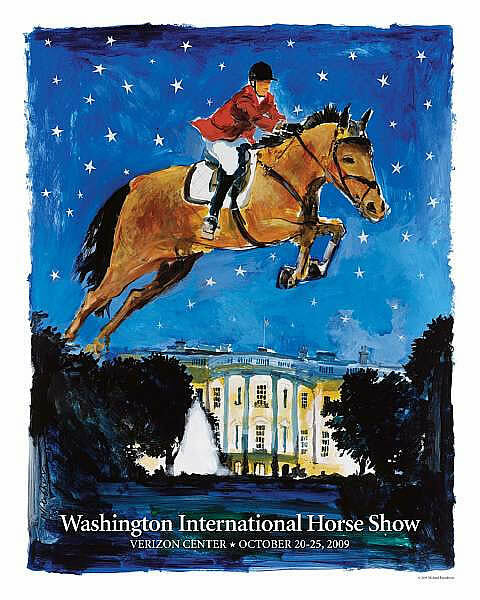 The Washington International Horse Show (WIHS), the leading indoor equestrian event in the U.S., is seeking original poster designs for its 52nd annual event, to be held Oct. 26-31, 2010, at Verizon Center in Washington, D.C. The six-day equine extravaganza features the country’s leading horses and riders in exciting jumping competition. The poster contest is open to U.S.-based artists, both amateur and professional, 18 years or older. A maximum of three entries per artist will be accepted. There is no entry fee. Artists submit photos (prints or digital files) of their work (not slides, not original art). The work submitted must be original and may be in any medium suitable for duplicating on posters and souvenir merchandise. The deadline for entries is 4:00 P.M., Monday, May 31, 2010. Entries should be inspired by the WIHS and reflect an equestrian or horse theme. Artists also should consider the event’s longstanding ties to Washington, D.C. The winning design will be selected by a panel of judges and will be used to promote the 2010 horse show. The winning artist will receive significant publicity, 100 posters and a package of all other items produced with the winning design, plus four weeklong passes to the show and other items. The artist retains the original artwork. Previous poster designers include well-known illustrator Mickey Paraskevas as well as Virginia-based artists Jane Gaston and Dagmar Giffen Cosby. For complete contest rules and entry blank and a sampling of some of the wonderful WIHS posters from past years, visit: WIHS 2010 Poster Contest. An equestrian tradition since 1958, the Washington International Horse Show brings top horses and riders from the U.S. and abroad, including Olympic champions, to the nation’s capital to compete for more than $400,000 in prize money and championship titles. About 500 horses participate in show jumping, hunter and equitation events during the six-day show. Special exhibitions, boutique shopping and educational and community events round out this family-friendly show. Since its debut, the Washington International has been a popular Washington, D.C., fixture visited by presidents, first ladies, celebrities, business and military leaders, as well as countless horse enthusiasts of all ages. WIHS, a 501(c)(3) nonprofit, charitable organization, is headquartered in Washington, D.C. Learn more at www.wihs.org.